The present study aimed at exploring the relations between body mass index (BMI) and stature and testicular cancer in a huge Norwegian cohort with measured height and weight. Height and weight were measured in 600,000 Norwegian men aged 14–44 years during 1963–2001. Results from parts of the study cohort have been reported previously. During follow-up, 1,357 testicular cancers were registered. Relative risks (RRs) of testicular cancer were estimated using Cox proportional hazards regression. The risk of testicular cancer decreased with adult BMI. 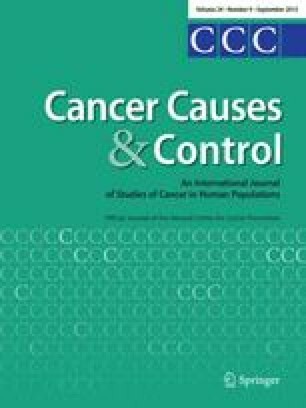 Compared with men with normal BMI, overweight and obese men had a relative risk of cancer of 0.89 (95% CI: 0.77–1.03) and 0.83 (95% CI: 0.58–1.17). The relative risk of testicular cancer per unit increase in BMI was 0.97 (95% CI: 0.95–1.00). The risk of testicular cancer was not associated with adolescent BMI. A moderate increase in risk of seminomas was seen with increasing adult height. Compared with men with height 170–79 cm, men with height 180 cm and above had a relative risk of 1.17 (95% CI: 1.00–1.37). We are grateful to those who during almost 40 years collected the data used in the present study. These are persons connected to the former National Health Screening Service, The Nord-Trøndelag Health Survey (HUNT), The Hordaland Health Survey (HUSK) and The Tromsø Study.